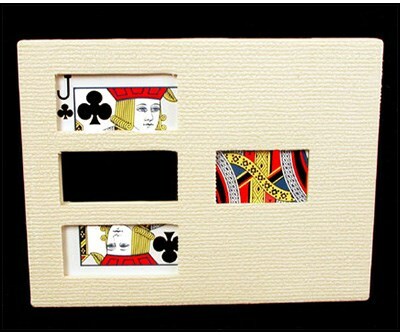 A chosen card is inserted into the frame. Then the magician, without any suspicious movements, VISIBLY moves the middle part of the card. Everyone will clearly see that the card is divided into three sections and the effect is really incredible. To finish, the magician pushes the middle part of the card back into its original position; he slips the card out of the frame and shows the card completely restored! Made with an ORIGINAL BICYCLE CARD. Totally automatic, the frame does all the work for you. No sleight of hand required. Frame size: cm 13,5 x 1 x 10.